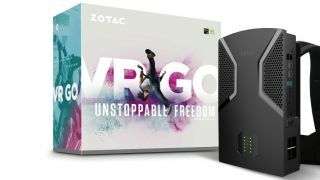 Zotac’s VR Go has gone on sale in the US, revealing the full spec of the virtual reality backpack PC, which retails at a cool $2,000 (around £1,600, AU$2,680). A few firms are making VR backpacks, which are designed to avoid the problem of tripping on trailing cables that run from your headset to a PC, but previously all we knew about the power of this offering was that it was using a GTX 1070 for a graphics card. As mentioned, now we know the full specification, with an Intel Core i7-6700T processor (2.8GHz with Turbo to 3.6GHz) running the show alongside the GTX 1070 (which has 8GB of video RAM), backed up with 16GB of DDR4 system RAM (which can be expanded to 32GB). You also get a 240GB M.2 SATA SSD, along with a spare 2.5-inch drive bay if you want to whack in some additional storage. In terms of connectivity, there’s a pair of DisplayPort 1.3 connectors, and three HDMI 2.0 ports, along with a pair of Gigabit Ethernet ports plus 802.11ac Wi-Fi. There are also six USB 3.0 ports. Furthermore, you get a pair of 6600mAh lithium-ion batteries which are hot-swappable, meaning you can change them without interrupting your VR gaming experience. According to Zotac, the two batteries will give users up to two hours of gameplay, although that will of course depend on how stressed the hardware is getting by the game. You also get a charging dock bundled with the backpack to juice those batteries up, complete with an easily visible LED indicator to let you know how long the charging process will take. Zotac also says that the VR Go is built with comfort very much in mind, so the weight is evenly distributed across the backpack for good ergonomics, and there’s a foam back support and padded shoulder straps. Heat from the components is also directed away from the wearer for obvious comfort reasons, as well.